There’s nothing that exciting about Canary Wharf’s soulless shopping malls and office complexes. Hosting corporate entities ranging from Starbucks and Costa Coffee to HMV and Topshop, you could be in any number of places in Britain, if not the world. And despite the wonderful river views, and the effort estate developers have put in to landscaping gardens, the immediate area to me seems artificial and lacking in character. But what is fascinating, however, is the walk you can do from the fringes of the City, by the Tower of London, to actually reach Canary Wharf. If you let the pathways along the north bank of the Thames be your guide, you’re in for a journey of discovery through 500 years of docklands history. Heading east from Tower Hill Underground station on a chilly winter’s day this weekend, I walked through what by the 16th century had become hamlets populated by people who earned their living from the river. The likes of Wapping, Shadwell and Limehouse would develop further over the years as overspills from the burgeoning City of London to the west. Today, many people know these places as simply stops on the Overground line or DLR as they travel from central London to Canary Wharf and beyond. And rather than being communities in their own right, they are often merged into one – individual identities can be amalgamated into the much more general term of ‘Docklands’, something invented by marketers in the 1980s in an attempt to rejuvenate the area when the docks closed to commercial traffic. There has been a considerable amount of re-development in the area in recent decades, to the extent that the three and a half mile stretch I walked from Tower Hill to Canary Wharf is now largely lined with luxurious modern waterfront apartment complexes enjoying spectacular views over the Thames. But walk slowly, soaking in the nautical heritage, and you’ll still evidence of when life on the docks was very different to that enjoyed by the wealthy of today. Take the area around Wapping Overground station, for example. Today, it’s both residential and home to News International, publishers of the Times and Sun newspapers. But in the 18th century it was an isolated village, made up of sailors, shipbuilders and other tradesmen, and surrounded by marshes. Some of Wapping’s pubs hark back to this time. The Town of Ramsgate, for example, claims to date back to the early 17th century and was named after the sailors from Ramsgate who used to moor their ships at Wapping Old Stairs before enjoying a drink (or two!) inside. Wine cellars, which survive today, were used to hold criminals and were also used by the Admiralty to hold those unlucky enough to have been ‘press ganged’ into joining the Navy. Further east you have the Prospect of Whitby, today a popular gastropub, which is said by some to date back as far as the 1520s. And on Narrow Street, in amongst some wonderful late 17th and early 18th houses, there is the Grapes public house. Re-built in the 1720s, Charles Dickens first visited as a boy and used the pub as inspiration for his novel, Our Mutual Friend. But over the course of the 19th century extensive development on both sides of the Thames would change communities east of the City of London forever. As Britain’s overseas colonies grew, prompting increased demand to carry produce and goods to and from London’s docks, the old medieval quays were becoming highly congested. Ships could sometimes be forced to wait weeks or even months to load or unload their cargoes. With tonnage carried through the docks increasing by some 300 per cent over the course of the 18th century drastic action was needed. In response to campaigns from angry London merchants, whose cargoes were vulnerable to the weather and pirates as they waited, the government signed the 1799 West India Dock Act, prompting the creation of a purpose built dock, dug out of marshy land on the Isle of Dogs, today appropriately the location of the Museum of London Docklands. The new dock, with massive warehouses and tight security, was used exclusively by the West India Company, but the passing of the 1800 the London Dock Act paved the way for the London Company to create new docks at Wapping. The area was by this time densely populated and large numbers of residents were evicted for the development. Once complete, it would import tobacco, brandy and rice. With so many people living in cramped conditions the living conditions deteriorated during 19th century into what could only be described as slums. The homes of ordinary workers would have been in stark contrast to the fine houses of the London Docks officials, surviving at Wapping Pier Head and built between 1810 and 1813. Perhaps the most controversial development was St katharine’s dock, inaugurated in 1824, near where I started my walk and just to the east of Tower Bridge. Today it’s a pleasant place to head at the weekend and enjoy a coffee overlooking the Marina filled with plush yachts (see Bean Out Britain for my recommendation). However, when it was constructed it was densely populated with homes and there was also St Katharine’s Hospital which had existed since Medieval times. Only the latter was compensated and many people were left homeless. Mayhew noted how the new docks at St Katharine’s improved efficiency “cargoes are raised into the warehouses out of the hold of the ship without the goods being deposited on the quay… in one fifth of the usual time.” The dock specialised in luxury goods like sugar, spices, wines, perfumes and marbles, but it was not a commercial success as it couldn’t accommodate the biggest ships at the time and it was forced to merge with its competitor, London Docks, which owned the docks at Wapping. And as with other London docks, trade began to fall away at St Katharine’s in the 1960s as it struggled to compete with the large container ports at the likes of Felixstone. It closed in 1968 and others along the three and a half mile stretch I walked were shut to commercial traffic by 1980. Between 1975 and 1982 jobs on the Isle of Dogs fell from 8000 to 600. The London Docklands Development Corporation was founded in 1981 to prompt re-development, and in the years that followed numerous apartments and offices were created, the most famous of the latter group of course One Canada Square. Until being surpassed by the Shard in 2010 it was the country’s tallest building. The building of the DLR which greatly improved transport links to the former docks, made re-locating both businesses and encouraging people to set up homes in the dock areas vastly more attractive. Industrial buildings lay derelict when the docks closed and many were pulled down. 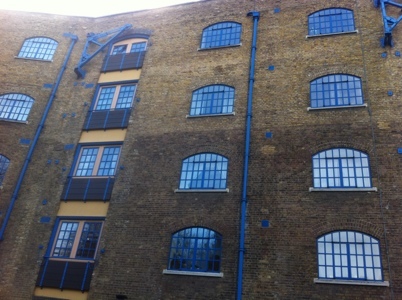 But there are numerous examples of former warehouses being lovingly restored and turned into very smart apartments, like that once owned by the East India Company. Some of the docks were filled in as part of the re-developments, but there are survivors. In addition to the marina at St Katharine’s we also have Limehouse Basin and Shadwell Basin for example. Again, apartments have been built around them, affording what can only be spectacular waterfront views. And watersports companies have been set up to offer kayaking and the like. Right through my walk, One Canada Square, with its offices and shopping malls below, was by and large there in view in front of me. At night when lit up it looks particularly spectacular. It is an amazing feat of engineering and architecture. And the business activities that go on inside bring in enormous wealth to the British economy. Even if much of the development in Canary Wharf is lacking in character, you still have to celebrate the fact that the docks are no longer lying derelict and it’s a thriving area of London again. But rather than the soulless shopping malls and offices, I still prefer the walk through history to get there. I love the shopping malls of Canary Wharf – I think “soulless” is rather harsh!! Great blog though. Thanks for your comment. I’m not a massive fan of shopping malls – but I guess as far as they go it’s not overly bad, I just prefer history! I love ‘walking’ through my home town through your eyes Mark. Thank you. Thoroughly enjoyed this wander.